This year has been fairly quiet for my climbing. However I have not been doing nothing with my time. I have in fact been in training. Training for a different kind of challenge. This challenge is to run. Something I have not done since completing The GSR five years ago. The reason I haven’t run for so long is that I discovered just after I started to notice my hearing loss that when running at the gym I suffered with motion sickness. But I have (in secret) been completing my own variation of ‘couch to 5k’ I have even been taking off my Apple Watch as to not alert my friends who I share my activity with aware of my training. My training has been on a set flat path at the far side of a local leisure centre parkland. I have not quite manaeged a full 5k to date, but I have discovered that on a flat concrete path I do not suffer with the motion sickness I had suffered on each occasion (I tried several times at different times etc) of a treadmill run. So, why am I letting you all know my secret? Well, this Sunday I am attending a race. A flat course where I will have a guide runner and my children. 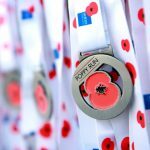 This Sunday we will undertake The Poppy Run. This run is organised to raise money for The Royal British Legion. Those who have followed me for some time will know how much I love the poppy. I love what it represents and I am forever grateful to those who have stood up protected our country. So, along with my children, my guide dog Fizz (who isn’t running in harness, rather joining the other dogs who are welcome to join in the days events) and my friend and guide runner Vicky on Sunday 4th November at 11am we shall stand in silence for 2 minutes before setting off on the 5km course around Southampton Common. I am doing this for other reasons. This day is one I wish to celebrate and what better way could I do that then support a fantastic charity and face a personal challenge? Well, maybe it’s because the girl in me enjoys a bit of bling and I can’t wait to complete the run to receive my poppy medal. So, dear readers I ask for your support. As I am sure you are aware this year marks 100 years since the end of the First World War, a war where so many have their lives to enable us to keep our future. As a family with multiple different surnames we have set up our just giving page as ‘Madhouse Family Poppy Run’ We would love to smash our £100 target. Its hard to believe that Monday this week marked four years since I took on my first challenge….. The challenge to climb The Gherkin. A challenge that took a twist when my CPiC and I decided rather than to climb the height between us, we would climb the height each. For me, ‘The Gherkin’ was to prove (mostly to myself) that I could undertake that level of endurance. For Simon it was a slightly different challenge; for him it was about climbing blindfolded. 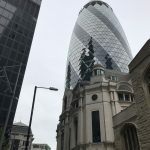 A challenge that together, we improved upon in May 2017 when we chose another iconic and interestingly nicknamed building of London’s skyline when we set about the challenge of scaling all 225m of ‘The Cheesegrater. So….. 180m up a gherkin, 224m up a cheesegrater. What number could possibly come next? What if I told you the number involved was 270? What would your thoughts be? I can also tell you that the next challenge WON’T be a climb. However, it will very much involve LONDON. And no, this isn’t about setting a (be it a belated) Resolution. This is about the realisation that after just over a month into 2018 I have faced and fought, fought and (sometimes) lost and lost and re-found my own sense of strength. 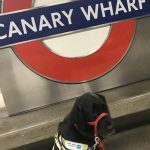 If you are a regular reader you will know that this year started with the sad loss of my first guide dog Vicky. But with the sadness of loosing her; along with the adjustment of ‘just having Fizz’ I found a passion. A passion that has always been in me, but for one reason….. Or rather one EXCUSE or another I had forgotten it. It is so easy to forget those simple passions that can bring such pleasure when ‘life’ keeps getting in the way. When we said goodbye to Vicky I suddenly realised how much I loathed being at home. How I couldn’t bare the ‘silence’, the little things about her like hearing her dream. It also took me several weeks to ‘forget’ to say hello to her when we came in. One of the strangest things was coming home to a silent house! Because for the past 3 years I have always left on the tv or the radio to keep her company, so she didn’t feel alone. So, as painful and upsetting as returning to a quiet house was, sitting in one was even worse! And this is where my passion reignited. When the children weren’t home (because of school or being with their dads) I disappeared off for a walk. The beauty of a walk is that Fizz could always come too. The beauty of a walk is that I could just ‘stomp’ out my upset. The other beauty of walking is that I could track it all on my Apple Watch, to judge the distance, to track my pace and after several weeks to gauge how my fitness had improved, because the very same walk from my house to town isn’t taking as long! The other bonus of my walking is that I could feel free. I don’t need to rely on another person to walk, I don’t need to rely on any equipment or memberships. I just ‘harness up’ Fizz and head out. Sometimes we get the bus to the beach, sometimes we take a different route into town. And other times we enjoy a stomp through the muddy bridal ways en route to the pub with friends! Your probably wondering why I am telling you all this in this post? Well, you see I have decided to make this walking count. I haven’t finalised the details yet, but with a group of friends I am looking to complete The Three Peak Challenge in late Summer. Its just over 26 miles and with a tour guide is a walk that is set to take between 9 and 12 hours to complete. And for obvious reasons (such as exhaustion, concentration and distractions) it is one walk that Fizz won’t be completing with me! But that doesn’t mean that she can’t help with my training !! And why I hear you ask……..
Well, you see ReSound have just made a massive development with their hearing aids, having raised just over £1,000 for them, I want to ‘earn’ the remaining £2,500 towards enabling me to purchase the new and improved LinX 3D (an improvement on the LinX 2 that I had previously tried. So, one the challenge is set up you can show your support with words of encouragement, pennies to help reach the target OR by joining in on the walk yourself. Just what you need to hear when you have a journey to Newcastle to make for the final round of the BmC Paraclimbing comps for 2017. So, to cover all eventualities a pup sitter was sourced for both Vicky and Fizz (us humans getting stranded in the snow is one thing, but not at all suitable for a dog; extra layers and clothes packed; along with extra car supplies SHOULD we end up stuck. Driving up wasn’t an issue, apart from the odd icy patch, we managed to make good time. Saturday morning we awoke to frost, but thankfully NO SNOW. But the temperature was too cold. It would actually have to warm up to snow. And I am sure I have mentioned before how cold weather and climbing centres don’t really mix? Especially when said climbing centre is inside an old church…. So, base layers, t-shirts, jumpers, coats AND hats at the ready I was warm. (But totally unable to climb with all these layers. Newcastle Climbing Centre had restricted entry, it was only available for the competition, which made for a much quieter and less stressful day, but it was really REALLY really COLD. 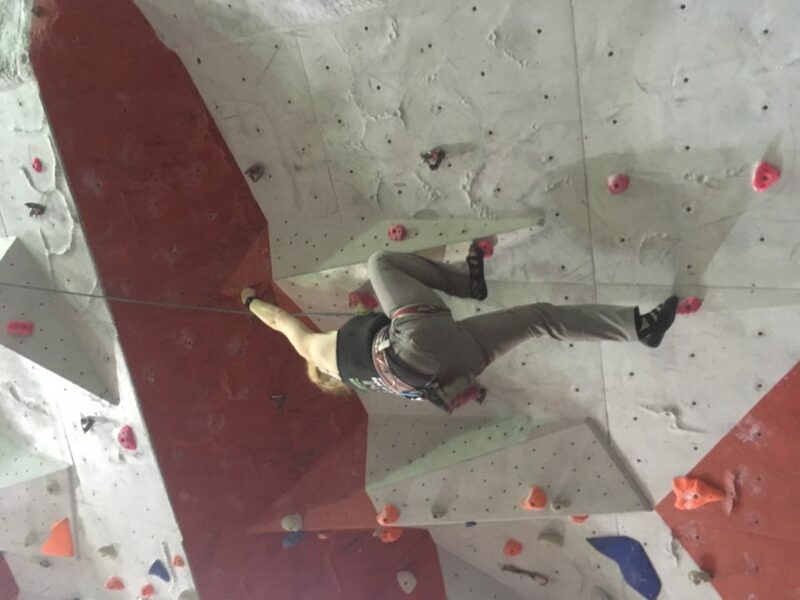 The first top rope route was long, it wasn’t technically difficult, but such a high route in a cold setting and about 2/3rds of the way up I found myself having to move quickly from each hold, while at the same time unable to move quickly because of the temperature. This very problem caused me to come off rope rope two at a move that I should have had no trouble with. Top rope three was quirky, it saw me challenging my climbing style and making moves that I wouldn’t normally do, but these moves saw me reach higher than I ever expected. I was proud of this route, even though I didn’t too it. The bouldering problems were much easier to warm up for. Boulder problems are set on lower walls, with bigger crash mats underneath and as such, this area of the centre appeared warmer. Route one on the boulder saw me miss out the top hold for fear of sitting down and pulling up. Route two was more of a traverse around a corner and then up on a diagonal, a route where I managed to get the start of on my final try, but then slipped further on on it. Route three was a pig! I am being kind here because it would be rude to swear. 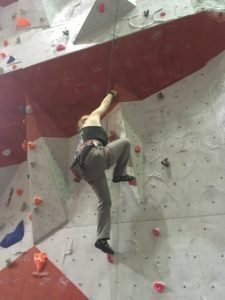 It was a route that started in an almost horizontal laid back position and then you were to climb backwards before moving upto a standing position of height. I was put off this route by watching some of the climbers I would count as ‘elite’ not managing to get past the backwards climb section of the problem. Not surprisingly I got to the starting golds of this route (where all my body was off the floor) but only managed to move one hand before coming off. My efforts were not in vien, these little ‘extra point’ moves saw me gain silver for this round of the competition. And accumulatively see me awarded with Silver for the series. However, the results of these competitions is not how the 2018 Paraclimbing team will be selected. This time around there will be a selection day in February in Sheffield. So watch this space …. 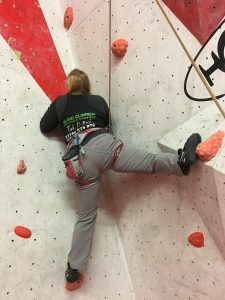 My climbing has changed dramatically in the last year, but will it be enough? This weekend saw the 3rd round of the BMC Paraclimbing series. The routes were set, the atmosphere was buzzing and the turn out was phenomenal. There were six competitors in female VI (according to the entry list anyway) and Abi a fellow vi Climber who often ‘flashed’ all her routes and boulders was here. So barring a natural disaster I set myself up for the best I could achieve would be a silver. ….. 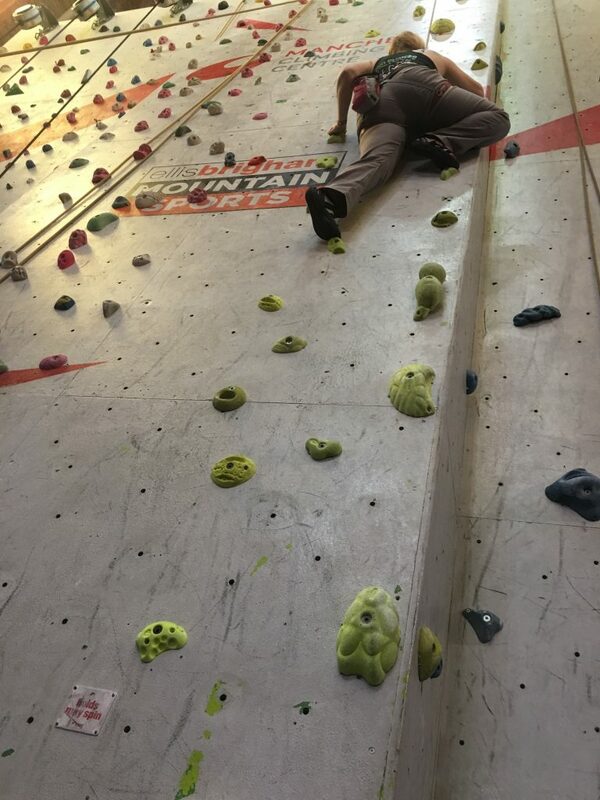 So what is a FLASH I hear you ask …..
To ‘Flash’ all routes and boulders is to get to the top hold on the first attempt. With the top rope climbing routes you only had one go to get the best score or to ‘flash’ the route, but with the boulder problems you are given 3 opportunities. Scoring a bonus 2 points if you succeed on the first go. Anyway, I set myself the personal challenge to beat my scores from the same competition last year. Knowing that the climbs had been set harder, this was my way of judging how I had improved in the past year. This is the same challenge I have set myself for each of the rounds. However one that, despite topping more routes and reaching higher in the routes I didn’t top, I didn’t actually achieve this in Edinburgh. But as we don’t climb the EXACT same routes each year this isn’t always a clear sign of improvement, they may have changed the scoring against how everyone performed last year. This was certainly the case for the 2nd round this year; after 3 of the 4 Male VI climbers scored maximum points, the route setters upped the challange for London. Given that the 3rd top rope in Manchester was graded as a 7a (2a grades above my comfort zone) the Competition was seen to be set for a much higher status. Usually as the routes go, boulder 1 and top rope 1 are lower grades, I flashed boulder 1, yet took a silly slip on top rope 1, costing me 26 points. The second boulder was a challange and one I had hoped to return to after a break (but time ran away from me) while boulder 3 was set as a challange to most. I was happy to get the minimum points of 47 on this as it was such a hard set. 47 Out of 60 meant I got both my feet off of the ground, which given there was only one foot hold and the hand holds had an interesting placement was quite an achievement and similar to many of my fellow competitors. Had time allowed I think a 3rd attempt on this route would have seen me complete it. 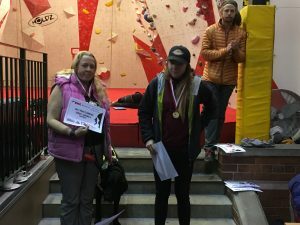 The sheer volume of competitors and lack of volunteers who could belay meant that the competition ran over by 35 minutes as it was. In which time I competed in the 3rd top rope, where I found myself scoring much higher than I expected. Once the competition was over it was time to calm down, take off my climbing shoes (hello feet) and harness and await the results. There were no podium blocks, but an innovative use of the stone steps that led upto the bouldering area and my catagory was read out. As expected, 1st place went to Abi (which I congratulated her on) then 2nd place …….. Me! I took my podium; accepted my medal and had my picture taken. There had been no 3rd place on the podium which I had felt was odd, but had honestly thought the person named as 3rd had left. It was only after all the podiums were announced that the organiser explained that the medals that hadn’t been handed out in London were ready for collection. It was at this point I discovered that a fellow female VI had been mis-catagoried and was in fact 2nd. So back went my shiny silver medal and out came the beautiful bronze! Sadly it was too late to re-take the podium photographs. So the only one I have is of me with my silver. So here is my ‘incorrect’ Podium photo showing me beside the beautiful Abi. This was in one of the many climbing books I have read, it is one that has (loosely) stuck with me. My CPiC often says think positively and you can achieve anything. Well, on Tuesday I attended the 2nd round of the BMC 2017 Paraclimbing competition at The Castle Climbing Centre in London. And I am beginning to think I shouldn’t have gone. I have lots of things going on in my personal life at this time that I am trying to work my way through, the funny weather and darker evenings are beginning to take effect too. So to say I wasn’t on top form on Tuesday would be an understatement! I was exhausted, I was emotionally tired before the climbing even started and it was only a very last minute decision that actually saw me attend. Because up until 10pm Monday night I wasn’t going to go. I didn’t want to go and perform badly. But some smooth words of encouragement from my CPiC and I changed my mind, because going and performing badly would still put me above where I would be if I didn’t show up. So I was already beating my worst possible scoring just by showing up and getting my hands and feet on those first holds. I set myself a personal challenge to get through the day. But if you dont reach for it, you won’t know if you could have made it. My footwork was clunky and I was ill spending energy because of it, but I made it to the top of my first climb and a sense of pride kicked in. I. may actually know how to do this! But I was already physically tired and cold. Never a good mix when you have problems to solve and climbs to overcome. I was also starting to struggle with the venue. There was an AMAZING turn out for the competition, with people coming far and wide. The Centre was only open for the competition. So everyone there was there for just one thing. The noise was unbearable and distracting at times. There were different languages, accents and pitches of voices in addition to well deserved cheers and applauses to those climber who had pulled of a good move or topped a route. I wanted to take my hearing aids out. But instead I took myself out. Actually I took myself and Fizz out. Outside to stand amongst the relative quiet (by comparison) busy part of London. Fizz got to sniff the grass and investigate the lavender bushes while I got to breathe. Breathing; all be it a fundemental to surviving is often something I forget to do when I am concentrating on a problem or a climb. 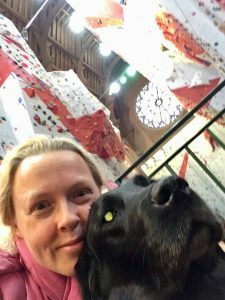 I found myself crying as I breathed in; I found myself sitting on the sandy, stony path burying my head into Fizz’s neck as she offered me reassurance. I found myself feeling rediculous. So I stood up, dusted myself off went back inside to finish what I started. To climb !! Thankfullly my brief departure went unnotice (or at least unmentioned) and I was able to warm myself up with a hot drink and face the climbs ahead. It wasn’t my best performance. But although I wasn’t at my best, I did complete all of my climbs and my boulder problems. And by the end of the day I felt much better for showing up and not going up. The troubles I have are still there and still need to be deal with, but for this competition I did go. And for that I am thankful. I am equal to everybody else. This comment has had a profound effect on me. A friend asked me a few months ago; how do you feel when your climbing? I couldn’t answer. I told her it was something I would have to think about and come back to her on. It is a simple enough question isn’t it? How do I feel when I am climbing? No-one is looking at me when I am climbing, they are all too busy concentrating on their own climbs or climbing partners. I have no idea what it looks like to climb (not first hand, without zooming in on pictures) therefore I do not feel conscious of how I look. Don’t get me wrong there is the odd occasion I come down off a wall and I can feel the sweat stinging my eyes and I have a fair idea of how red and sweaty I look, but that is no different to any other Climber that has just given their all. Climbing is not something I have known with much better sight. It is not like the sight I had 15 years ago, which although pretty poor was much clearer than the sight I have now; the sort of sight that wearing glasses made a real difference; where as now they only really help with REALLY close up things. An example, as a child I rode a bike, as an adult I rode a bike and even up until last year I felt comfortable riding a bike. Since my hearing loss I have found it a real struggle to feel safe on a bike. Not the physical movement of actually turning the peddles and making the wheels move, but the ability to even judge how far my foot is from the ground. I refuse to give up on ever riding again, but my days of riding alone or just taking the kids out are gone. With climbing there isn’t this feeling. Because the routes on walls are very rarely the same after 3 months, there is no ‘marker’ to judge my changes in sight. The only way I can judge my climbing is the same as anyone with any type of sport…… How I feel the next day !! I am working on stretching and movement, on endurance and core strength, which in turn is improving my climbing. When I am on a wall, only the thought of reaching the next hold and getting further than I did before is on my mind. My sight loss and hearing loss don’t come into it. They make up such a small part of me as a person, and yes they clearly do have an affect on the way I climb. But for me I JUST CLIMB. And just as Nik Royale (BMC Article linked here) commented how he felt about climbing over 5 years ago; I find myself absorbing his comment and believing in it, regardless of if you take part in Paraclimbing or other forms of competition. Climbing is about equality. A climbing wall doesn’t care about the colour of your skin, how your body looks or even how your body works. It enables you to find a way, to reach personal challenges and milestones. It is simply there for you to climb it. It’s not the reading that’s the issue….. In a way to improve myself I am undertaking many different forms of learning. Some is personal development, some is an education and some of it is to support my family. One such learning is a 10 week parenting puzzle. It isn’t a course that holds a secret instruction manual to raising children, rather it looks at ways in which as adults we have to dispel our own learnings as a child, to move past it and to understand ourselves better to support our children. As the weeks have added up, the inner-termole of the course content has began to take an effect. This teamed with counselling I have been undertaking to support me and help me with my anxieties and depression…… Has been giving me plenty to think about. It has been commented (not as a critisism, more an observation) that I have become quieter as the weeks have rolled on. The group I am in are very understanding and supportive towards everyone. This week we were given an extra book. 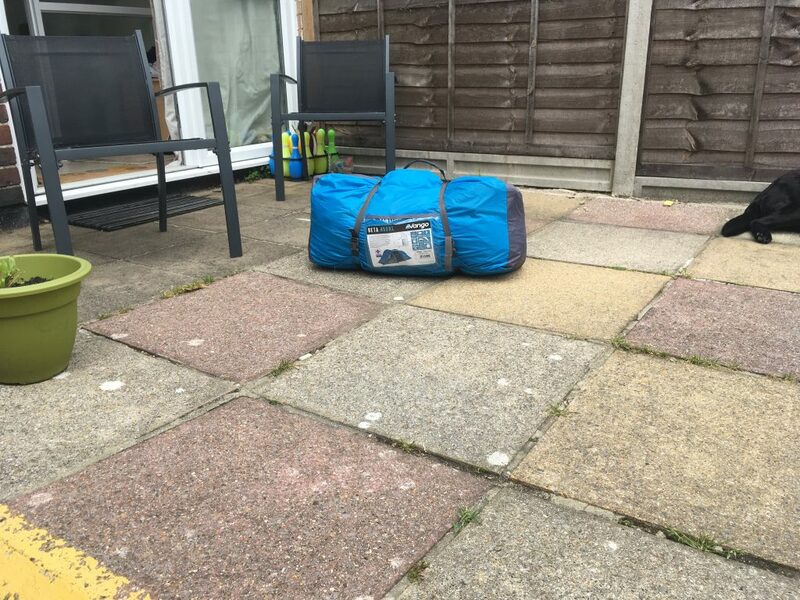 “The huge bag of Worries” by Virginia Ironside. It is a beautifully illustrated children’s book, yet one that is also written for adults too. As part of our group, those leading us asked if one of us would read the book to the group. The intakes of breath were audible and noticed by others. You see, I am an educated woman, I have a passion for reading, it is just my sight that doesn’t always play along! Being a book to be read to and read by children; the type was larger, clearer and only briefly obscured by the illustrations behind. I took a deep breathe and began to read. I enjoyed the book. I felt myself giving the characters tone and passion as the punctuation implied. I felt saddened momentarily when it ended. I closed the book and placed it on my lap. I felt touched by the story; I felt that the story was so much more than a ‘children’s book’ it meant something. I had also done something that I hadn’t done for many, many, MANY years. I had read aloud to people other than my children. You see, this is not just a little thing. This is a MASSIVE thing. I feel anxious reading, not because I dislike it, (far from it) more because I fear that I will miss words, not see them; especially in a children’s book, where the words can wrap around and over the pictures. For someone who loves to read, yet faces my own worries over the act of reading. It felt like it was a truly enlightening moment. One that will hopefully stay with me for many years to come. I have since ordered my own copy of the book, shared it with friends on Facebook and am looking forward to reading it to my own children. You see, it isn’t the reading that’s the issue. It’s the seeing the words. So, in recent months I have conquered a Cheese-grater, climber my arse off and began to face many of my demons. But none of these, or even all the climbing competitions I took part in last year compared to this mornings events. Having told you all about my change of volunteer role in Scouting I did what anyone would do; in preparation for an upcoming weekend. I had previously gone to a large outdoors shop with a friend and had a good look at all they had on show, I fell in love with a canvas Tippee. However at just under £800 it wasn’t going to be for me at the moment. I was able to walk among various sizes and layouts. But as with everything, budget was my biggest factor. To have a separate bedroom area. Have a black out bedroom area. 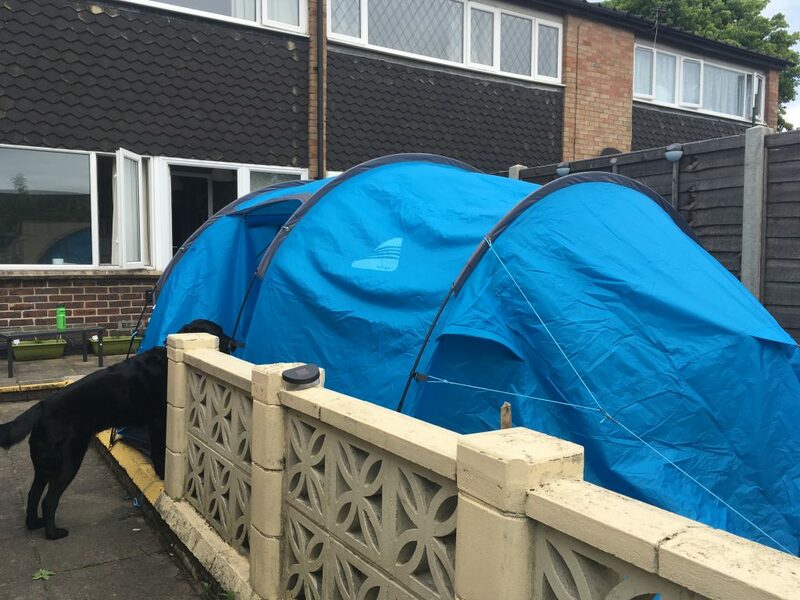 And with all this, and the wise words of a good friend who had bought many a tent. I bought one I felt fit the bill. 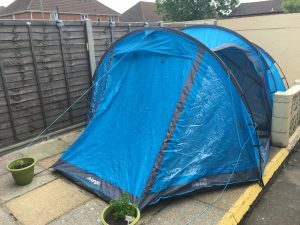 I bought a Vango Beta 450 XL in blue. It arrived yesterday, sat in its box and making me itch with excitement. The rational in me thought I should wait until I had a friend over to help me, however the ‘kid in a candy store’ won out. And I set about putting it up! After all, it had an assembly guide of 15 minutes. How difficult could it REALLY be? For a start, it took AN HOUR. 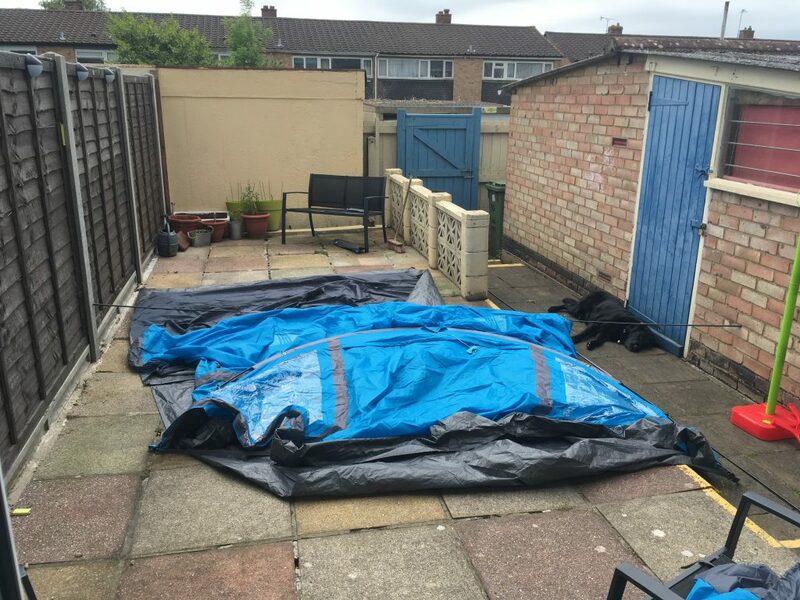 Oh and it was a tad bigger than my garden. Also, with my garden being totally laid in patio, I wasn’t able to fully ‘pitch’ it. Although with a helping hand of my garden furniture and a few plant pots, I got pretty close! I had watchful eyes in both Vicky and Fizz who seemed quite amused at times by my antics. They both had a thorough explore of it; both in its flat form and in its ‘pitched’ form. I photographed my progress just for you. In the beginning there was just a ground sheet and a flat tent. 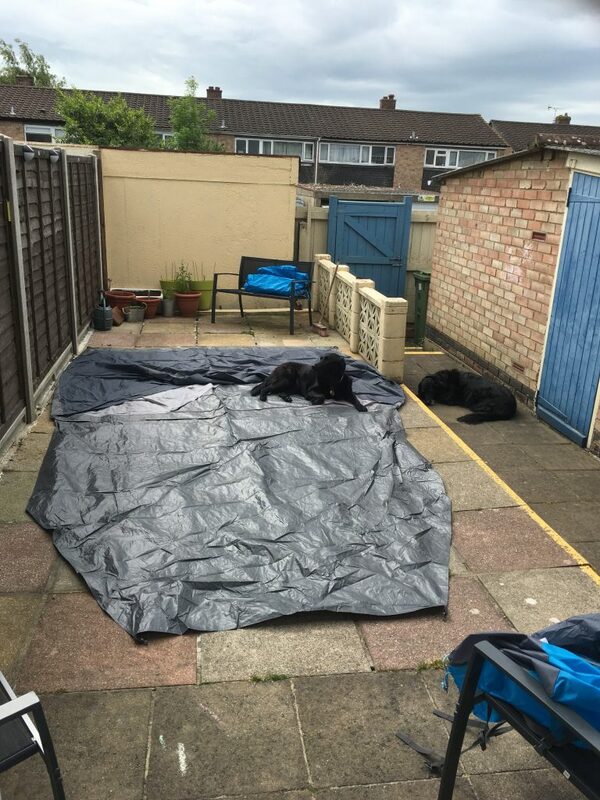 3 poles, colour coded for ease with 1 pole longer than the other 2.
colohr coded ….. check; if you count 2 being totally black and 1 having a grey section amongst the black colour? Maybe I should have stopped at that point. But given it was all out of the bag, no harm in carrying on. So following the colour coding; or rather tiny little black or gray tabs of material on the end of the pole sleeve that I hoped was what the instructions were referring too, I carried on. And then came my garden furniture. 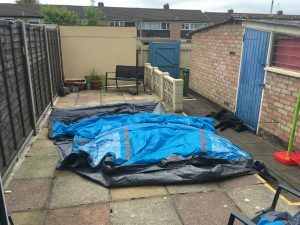 With the help of a garden chair, a bench and some plant pots I was able to semi-secure the tent in place. The guide ropes and zip toggles are all light blue, there are tension bands on the inside and it has a ‘lip’ to save the weather getting in, should it be wet. And the added bonus is that I only have to duck my head ever so slightly to move around. Look what I just did, not bad considering, am knackered now. Woth the guide time of 15 minutes, with the advisory that first pitch may take slightly longer, I was happy when I discovered it took me and hour. Some people may not feel that is something to be proud of, but for someone who has never pitched a tenth before, who has considerably limited vision and who has no help either with reading the instructions or pointing out where the pole sleeves were…… I am totally amazed and proud with my achievement. …… Now to take it down! In comparison that took 30 minutes, it was a simple reverse of the pitch. 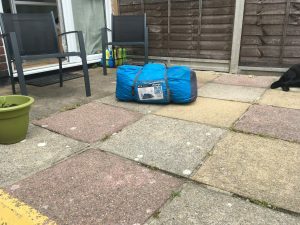 I folded and rolled my tent, then the ground sheet and even managed to get it all back in the bag! It wasn’t quite as pretty as when I took it out, but with a quick sitting on to help remove the air. It was done and ready to put away for camping later next month. Now to see how long it takes to pitch in a field ! !